It started out like any other Wednesday...I woke up, read a few blogs, went back to sleep because it was still dark out (gotta love not being able to sleep through the night), woke up again when my alarm went off at 7:00 am, dressed and went to my workout. Brad divided us into two groups of three - my group went with him to the gym first, where we did some killer arm exercises which were very challenging. Then we switched over to Linda and cardio - I knew something was up when she told us to take a potty break if we needed it (she never does this) - and then as it was dawning on me that she had changed into a tank top, she got this funny smile on her face and said "we're going running." Half a mile to Bee Creek Street, and half a mile back to the gym. I had a moment of panic, and then she said "I'll run with you the whole way. You can do it, I know you can." And by god, I did it. I ran the entire way, up to the street sign and back to the gym. Time: 11 minutes 55 seconds. I could not believe I did it! Tears were shed and hugs were exchanged - it was very emotional for both me and Linda. She's really been incredible with helping me get to my goals - and I had mentioned in July that I would like to be able to run a mile without stopping. I figured I might get there by the end of October. But today?!? Well, I ran for six minutes on the treadmill on Monday, and then six minutes, followed by two minutes of walking and then another two of running on Tuesday...and apparently that's when Linda knew I could do it. Because if you'd asked me, I would have said there is no way I was ready to run a mile. But she knew. And stayed with me the entire time, talking to me, encouraging me, pushing me - and celebrating with me when I finished. I can't remember a time when I felt so accomplished. So thanks, Linda (she reads this blog) - you are amazing! Later on, I checked Brad's Twitter page and look what he wrote - how very cool is this?!? What a wonderful day! I'm super excited for you! Wish I could have been a fly on the wall to see the tears. I love hallmark moments. Oh, this gave me goosebumps! Oh, WOW! What a wonderful moment - well done. WELL DONE!! That's great and at 11:55 that's a great time too. Double great! all of it from the running to your amazing support team. Brava! You are made entirely of awesome! Wonderful! I love how she sprung it on you so there's no time to worry about it...just had to do it - great job! What a great accomplishment, you should be so proud!! Roxie said it best - and I have to admit, my eyes welled up. You have done terrific! I can't give enough high fives for your accomplishment. Excellent! Shelley, this is totally a testimant to everything you have pushed for and continued to fight for. This 1 mile you ran, it's not just a mile. No, this is you shining through, this is you making a difference in your own life and in effect, inspiring others. Did you ever think you would run a mile? OMG, I am totally wishing I was there with you to run it with you! Oh my goodness. I'm all misty-eyed -- so very happy for you, woman! Congratulations on the big mile! Woo hoo. I am proud of you and envious of your abilities. I will om shanti while you're running. Congratulations on this big milestone! You are a runner! You surely do rock, Shelley! Congrats on your latest accomplishment! And many props to your team as well. The first mile is the hardest!!! Way to go! Oh Shelley I'm so proud of you! Well done girl! What a wonderful day you must have had! Big hug and kisses for you! I am so proud of you. It sounds like you are working with some very special people at your gym. You go Shelley! What a great day! So proud of you! Running outside is so different than on a treadmill! Yay you!!!!! Congratulations! As a beginning runner myself, I can imagine just how satisfying it was to do the whole mile outside . . . I AM SO PROUD OF (AND INSPIRED BY) YOU! Wow Shelley! Tears welled up in my eyes too. 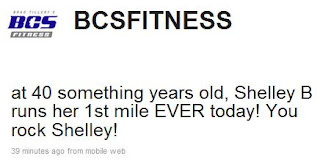 I remember the first time I ran a mile as an adult, at 44 years old, and I was just astounded that it was possible. Thanks for helping me remember that moment!